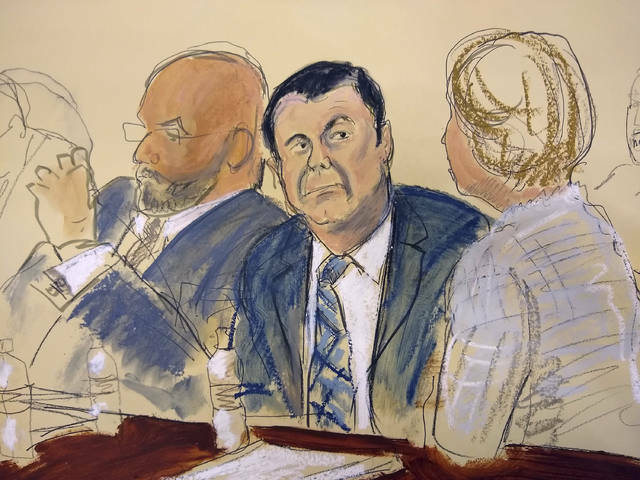 NEW YORK (AP) — A U.S. judge admonished the lawyer for Mexican drug smuggler El Chapo on Wednesday after an opening statement that riled Mexican presidents by accusing them of taking bribes. Cogan stopped short of that Wednesday, but admonished defense attorney Jeffrey Lichtman for having gone “far afield of direct or circumstantial proof.” He said he would instruct the jury to focus on the evidence. “Your opening statement handed out a promissory note that your case is not going to cash,” the judge said, calling Lichtman’s opening misleading. Lichtman said his client was not the real leader of a cartel that sent tons of cocaine into the U.S. He sought to shift blame to Ismael “El Mayo” Zambada, another reputed drug trafficker in the cartel’s leadership. Zambada remains on the loose in Mexico, Lichtman claimed, because of bribes that “go up to the very top,” including hundreds of millions of dollars paid to the current and former presidents of Mexico. Despite his diminutive stature and nickname that means “Shorty” in Spanish, Guzman was once a larger-than-life figure in Mexico who has been compared to Al Capone and Robin Hood and been the subject of ballads known as narcocorridos. Lichtman resumed his opening statement Wednesday, describing “the myth of El Chapo” as “very strong.” He said law enforcement agents had his client autograph $100 bills for them upon his arrest. The defense attorney also described the government’s witnesses as liars seeking to mitigate their own jail sentences.